We develop a model of the lac genetic switch that describes the switching and coexistence of phenotypes as a function of extracellular lactose concentration. 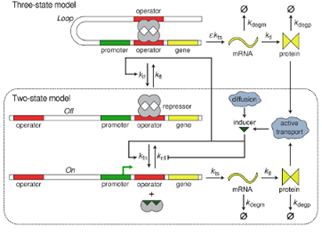 We present a first stochastic treatment of a gene–mRNA–protein model of the lac operon in E. coli interacting with extracellular inducer that includes transitions to looped DNA states. This highly interdisciplinary project, involving 2 post-docs and one graduate student, uses tools from physics and new mathematical tools to explain statistical aspects of stochastic gene expression.